It’s not unusual to read a press release from a governor’s or mayor’s office celebrating a deal to bring a new company to a neighborhood or city. Typically we’d be talking about a new manufacturing or tech firm, and the press release would speak glowingly of the prospects for economic development. Which makes a bit unusual the recent announcement, covered here by the Civil Eats website, by the city of Louisville that it had landed a food hub (what is to be the largest one in the nation). Five years ago hardly anyone had heard of food hubs. The concept is pretty simple. Farmers like to grow crops and raise animals–they don’t necessarily like to spend a lot of time marketing and distributing their products. Food hubs came into existence to fill the niche of aggregating these products and shipping them to restaurants, stores, and institutions. They typically do this with the help of a central warehouse, refrigerators, and a truck or two. Like slaughterhouses or even farmer’s markets, food hubs are elements of the local food infrastructure that were common all over the country 60 years ago. Then they all disappeared. As the local food movement grows, all these elements are starting to come back, despite the regulatory hurdles and a food and farm economy that has tilted toward very large farms and grocery chains. Thus far, most food hubs have been limited in their geographic scope, serving a single city or region. The Louisville facility won’t be different in that respect, but the physical size of the structure planned in the West Louisville neighborhood is certainly new. It will occupy a 24-acre site and will be designed to serve restaurants and local market buyers, industrial food processors, and a food bank at the same time. 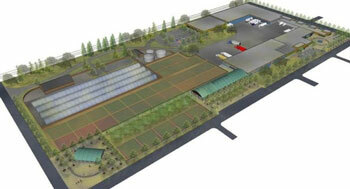 It will also feature an anaerobic digester that can turn food waste into energy. There is talk of up to 250 permanent jobs, many of which could go to people who live now in this relatively low-income part of the city. But another question is whether this is the inevitable direction food hubs must go, given that their primary purpose has been logistics. Most food hubs are nonprofits and depend, to a significant extent, on donations. At a recent conference in Virginia, the founder of Fair Food Philly talked about how her organization focuses on what she called “value chain facilitation,” which means building connections between farmers and buyers but not necessarily logistics. “Most of us did not get into this to own a truck,” she said, and wondered how many food hubs would still be around in a few years. She said upholding the values of fresh, healthy, affordable food, among others, is more important than the scale at which food organizations operate. She leaves the warehouse and trucking operations to other food hubs in the Philadelphia area, some of which are for-profits. Whatever the direction of food hubs, opening more markets for small farmers who sell real food is definitely a good thing, from either a sustainability or economic development perspective.